The Devon book trades : imprint registers. For details of the scope of these imprint registers, see the introduction and key. DEV_Exeter. Darker, Samuel. 1698. Printer. DEV_Exeter. Darker, Samuel. 1698. Printer. Chilcot, William, 1663 or 4-1711. A practical treatise concerning evil thoughts. Wherein are some things more especially useful for melancholy persons. By William Chilcot, M.A. - Exon : printed by Samuel Darker, for Charles Yeo, John Pearce, and Philip Bishop, 1698. - ,276,p ; 8°. - Wing2 C3847. - Held by: Devon Heritage Centre. - Dredge p.10; Sheaves 4 p.560. DEV_Exeter. Darker, Samuel. 1698. Printer. Church of England. A form of prayer for married persons. For the most part taken out of the liturgy of our church. And out of the form of solemnization of matrimony. To be devoutly used by them in private, once a day. - Exeter: printed by S. Darker, for Charles Yeo and John Pearce, 1698. - 8°. - Wing2 C4136 ; *Clough. DEV_Exeter. Darker, Samuel. 1698. Printer. Dunning, Richard. Bread for the poor : or, a method shewing how the poor may be maintained, and duly provided for, in a far more plentiful, and yet cheaper manner than now the are, without waste or want. ... - Exeter : Printed by Samuel Darker, for Charles Yeo, John Pearce, and Philip Bishop , 1698. - ,28p ; 4°. - Wing2 D2613; *Dredge p.94 (T.N.Brushfield); Davidson p.24, supp. p.1n (Secktor Lib. ); Plymouth Athenaeum p.16. DEV_Exeter. Darker, Samuel. 1698. Printer. King, Josiah. Mr. Blount's oracles of reason, examined and answered, in nine sections in which his many heterodox opinions are refuted, the Holy Scriptures and revealed religion are asserted, against deism & atheism by Josiah King, M.A. and Chaplain to the Right Honourable James Earl of Anglesey. - Exon : Printed by S. Darker for Ch. Yeo, J. Pearce and Ph. Bishop, Booksellers in Exon, and are to be sold by the booksellers of London and Westminster, 1698. - ,236,p ; 8°. - Wing2 K512. - Held by: Devon Heritage Centre. 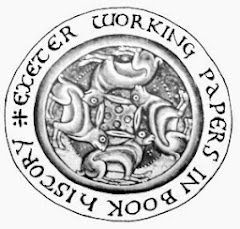 - Variant imprint: Exeter : Printed by S.Darker, for Philip Bishop, bookseller, over against the Guild-Hall, Exon, and are to be sold by the booksellers of London and Westminster , 1698. - Wing2 K512a ; *Dredge p10; Sheaf 5 p574. DEV_Exeter. Darker, Samuel. 1698. Printer. Select hymns: each fitted to two tunes, to be sung in churches. - Exeter: printed by S. Darker, for Philip Bishop, book-seller, over against the Guild-hall, Exon, 1698. - 46p ; 8°. - *Dredge p.94 (Dr. William's Library). DEV_Exeter. Darker, Samuel? 1698. Printer. Incorporation of Weavers Fullers and Shearmen, Exeter. The names of several persons trading in and depending upon the manufacturing of serges within the city of Exon, and parts adjacent, lately removed from thence into the kingdon of Ireland. - [Exeter?] : [s.n.] , [1698?]. - 1 sheet ; 1/2°. - Certified ... this 12th of March, 1697/8. - *NUC NE0219332; Wing2 N127a (Imprint [London?, 1698]). DEV_Exeter. Darker, Samuel and Farley, Samuel. 1698 - 1699. Printers. DEV_Exeter. Darker, Samuel and Farley, Samuel. 1698. Printers. Shower, Bartholomew, Sir, 1658-1701. The substance of what Sir Bartholomew Shower spake at the Guild-Hall Exon, August 19th, 1698. Upon declaring the poll for the burgesses of that city elected, to serve in this present Parliament. - Exeter: printed by Sam. Darker, and Sam. Farley, for Charles Yeo, John Pearce, and Philip Bishop, Booksellers in Exon, 1698. - 2p ; 1/2°. - *Devon and Exeter Institution; Davidson p.24; Calendar of State Papers Domestic p.377-9; Wing1 S3659. DEV_Exeter. Darker, Samuel and Farley, Samuel. 1698. Printers. Smith, Humphry, b. 1654 or 5. A sermon preached in St. Saviour's Church in Dartmouth, July 24th. anno Dom. 1698. Together with some reflections on the opinion of those, who affirm, that the only difference between the Church and the meeting-house, is that of a few ceremonies. In a letter to a friend. By Humfry Smith, M.A. - Exon : printed by Sam. Darker and Sam. Farley, for Charles Yeo, John Pearce, and Philip Bishop , 1698. - 4°. - Wing2 S4086; *Dredge p.62 (Bodleian). DEV_Exeter. Darker, Samuel and Farley, Samuel. 1698. Printers. Stooke, Francis. Concerning the remissness of the magistrate. A sermon preached in the parish-church of Bovey-Tracy, last Easterday in the afternoon. By Francis Stooke, M.A., and vicar thereof. - Exeter: printed by Sam. Darker and Sam. Farley, for Charles Yeo, John Pearce, and Philip Bishop, booksellers in Exon, 1698. - ESTC. DEV_Exeter. Darker, Samuel and Farley, Samuel. 1699. Printers. Avant, Philip. The way of all the earth. Sermons preach'd at Salcomb-Regis, in the county of Devon. By Philip Avant, vic. ibid. - Exon : Printed by Sam. Darker, and Sam. Farley , 1699. - ,106+p ; 8°. - Not in Wing2; . - Held by: Devon Heritage Centre (copy lacks all after p.106). DEV_Exeter. Darker, Samuel and Farley, Samuel. 1699. Printers. Chandler, Samuel. An impartial account of the Portsmouth disputation. By Samuel Chandler, William Leigh, Benjamin Robinson. Published for the benefit of all, particularly for the undeceiving of those, who have been so basely imposed upon, by the (pretendedly) true narrative of Dr. William Russel. - Exon : printed by Sam. Darker and Sam. Farley, for Philip Bishop, at the Sign of the Bible in the Forestreet, 1699. - 4°. - ESTC ; Wing2 C1932 ; *Clough. DEV_Exeter. Darker, Samuel and Farley, Samuel. 1699. Printers. Exeter. Diocese. Articles of visitation and enquiry concerning matters ecclesiastical, exhibited to the ministers, church-wardens, and side-men, of every parish, within the Diocess of Exeter, at the visitation of the Right Reverend Father in God, Jonathan, by divine permission, Lord Bishop of Exeter in the year of our Lord, 1699. - Exon : Printed by Sam. Darker and Sam. Farley, for Charles Yeo, bookseller , 1699. - ,18p ; 4°. - Held by: Devon Heritage Centre. - Not in Wing2. DEV_Exeter. Darker, Samuel and Farley, Samuel. 1699. Printers. Gascoyne, Joel, b. 1650. To the right honourable, the nobility, the honourable, the gentry, of the county of Cornwall. May it please your honours, I have, with indefatigable pains ... compleated the map of your county of Cornwall ... - Exon : printed by Sam. Darker, and Sam. Farley, for Charle [sic] Yeo, bookseller in Exon , 1699. - Bs. - Reproduced in: *Devon and Cornwall Notes and Queries, v.32, p.34. - ESTC ; Original in Cornwall Record Office. - Not in Wing2. DEV_Exeter. Darker, Samuel and Farley, Samuel. 1699. Printers. Gilbert, John, b. 1658 or 9. A sermon on the sin of stealing custom, and the duty of paying tribute: from the 13. Rom. 7. v. Preached at St. Peter's Exon: by John Gilbert, M.A. one the canons residentiary of that church; and vicar of St. Andrew's Plymouth. - Exon : printed by Sam. Darker, and Sam. Farley for Charles Yeo, bookseller, 1699. - 4°. - Wing2 G709; *Clough. DEV_Exeter. Darker, Samuel and Farley, Samuel. 1699. Printers. Gilbert, John, d. 1722. A sermon preached at St. Andrew's Plymouth, January 30th, 1698/9. by John Gilbert, M.A. vicar there; and Canon of Exeter. With a preface defending King Charles the martyr, and the observation of his day, against the libels, and practice of such, who are enemies to both. - Exon : printed by Sam. Darker, and Sam. Farley, for Charles Yeo, bookseller, 1699. - 4°. - Wing2 G710; *Dredge p.11; Term catalogues Trinity 1699, iii,134 (for T.Bennet and C.Yeo only); DUL 29470. DEV_Exeter. Darker, Samuel and Farley, Samuel. 1699. Printers. Tenison, Thomas, 1636-1715. His Grace the Lord Archbishop of Canterbury's letter to the Right Reverend the Lords Bishops of his province. To the Right Reverend the Lord Bishop of Exeter. - [Exon : printed by Samuel Darker and Samuel Farley, over-against St. Paul's Church, for Charles Yeo, bookseller in the fore-street, 1699]. - *ESTC. DEV_Exeter. Darker, Samuel and Farley, Samuel. 1699. Printers. Whinnell, Thomas, fl. 1699. The best portion. Being a sermon preached at the funeral of Mrs. Mary Steed, in the city of Exon, November 16th, 1699. Wherein these three points are briefly handled. I. That those who have God for their portion, may in this life be exercised under great afflictions. II. That the interest of a believer in God, as his portion, is not at all weakned by the greatest affliction. III. That God only is a soul satisfying portion to a truebeliever, &c. By T.W. a lover of peace and truth. - Exon : printed by Sam. Darker and Sam. Farley, and are to be sold by H. Chaulklin, bookseller in Taunton, and at Joshua Mechoe's tobacconist in Exon, [1699?]. - ,34p ; 4°. - Held by: Devon Heritage Centre. - Davidson p.98 (Secktor Library); Plymouth Athenaeum p.15. DEV_Exeter. Darker, Samuel and Farley, Samuel. 1700. Printers. Hole, Matthew, 1639 or 40-1730. A practical exposition of the first part of the church-catechism: containing the preliminary questions, and the baptismal covenant. By a Divine of the Church of England. - Exon : printed by Samuel Farley, and S. Darker, for Charles Yeo, bookseller in the Fore-street, 1700. - ESTC. DEV_Exeter. Darker, Samuel and Farley, Samuel. 1700. Printers. BLIGHT, Francis. A true and impartial account of the dark and hellish power of witchcraft lately exercised on the body of the Reverend Mr. Wood, minister of Bodmyn : in a letter from a gentleman there, to his friend in Exon, together with a true copy of a letter from Mr. Wood to his uncle in Exon, in confirmation thereof. - Exeter : Printed by Sam. Darker and Sam. Farley , 1700. - p ; 2°. - Wing2 B3190; *Dredge p.11 (Maclean); Bibliotheca Cornubiensia p.26 ; ESTC. Copyright © Ian Maxted and the libraries represented 2014. This page last updated 28 February 2014.